Sometimes it's slow going but I'm getting there... working my way down my list of patterns 'to do'. 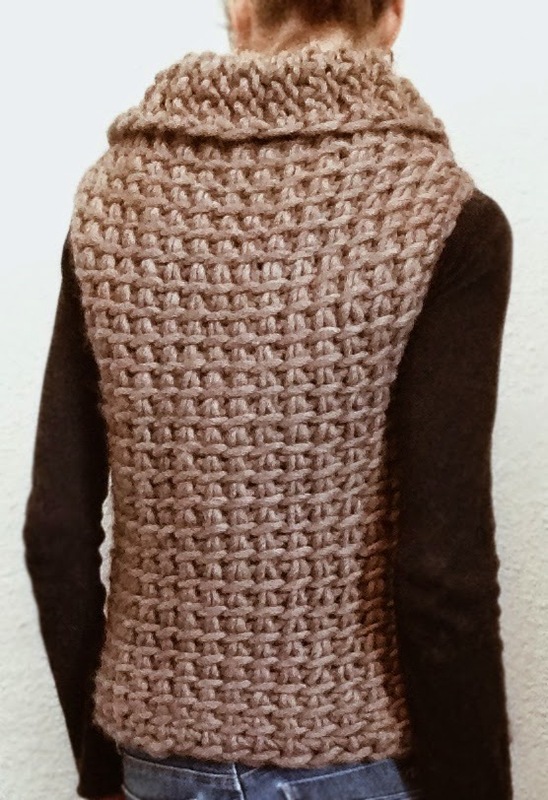 This vest I made over a year ago to coincide with my Tunisian crochet tutorial. A simple vest made side to side in one piece this is a great one to start with in Tunisian crochet. Made using approximately 300yds/275m of a chunky yarn like Magnum by Cascade (color shown 8013, Walnut Heather) and a size 'S' Tunisian crochet hook (I found mine on etsy) this could easily be worked up over a couple of nights. The pattern is a 'one size' but with notations on how to adjust the size if necessary. I know you've all heard it before ;) but I am currently working on the pattern for the crochet version of the Swing Coat!!! I should have the pattern available here by the beginning of June... like I said, slow going! hi there - can you tell me if you have been able to convert this to crochet (not Tunisian)? Could this be converted to super chunky? Could you please explain the process of the armhole, or post a tutorial. I am so confused about the process. Hi, I purchased your pattern yesterday and I love it but I am also confused about the armholes, would it be possible to get the video you mentioned? I, too, was confused. I watched a video on how to make buttonholes in Tunisian crochet and it worked beautifully. The directions here were confusing (to me, but it was also about 2 am). I like to use stash yarn for projects like this. I have about 4 strands of differing colors of gray wool to make the WPI that I needed. great pattern. I also made the basket weave cowl one day when I was tired of trying to make something else. looks great. I'll try to post photos to raverly. I am shopping for the S crochet hook, but am only finding 8" long.... do you know where I may find a longer S hook? Hi! Sorry for the very delayed reply... did we converse over email? I'm sure by now you found one but if you look in the top right column of the page you will find a link to one on easy. Hey I bought this pattern a few months ago and can't find it in my email. Is there anything specific I should searth? The only thing I'm finding is the actual order. Is there a knitted version of this T vest? I'am loving the vest pattern, however I cannot figure out the armholes either. My email address is michelledlehmann@gmail.ca can you please email the video tutorial to me. sigh.. why must so many pretty things like this be in crochet... I'm a knitter! I can't crochet to save my life! I'd love a knit pattern for something similar to this. I like this pattern. Before I purchase it, can you tell me exactly how large the pattern will be using the notations. One size fits all does not do it for me. Thank you. Hi.. will there be a crochet version of this please? Hi, how do you stop this from curling? Yours looks so nice and straight/flat and mine is curling terribly. Can I also have the video for the armhole please? Hello Karen what kind of needle did you use? I found that there are 2 sizes 22" and 25"? Can you recommend another yarn for this project? I've been searching for the cascade magnum yarn and have found that it's very expensive. thank you in advance. Compre el patrón. Ya empecé a tejer el chaleco pero no entiendo como tejer el cuello. Podrían explicarme. El patrón lo compro mi hija Adriana Salinas. Hello! You must be writing from the EU. Starting sometime within the last year or 2 the EU imposed a "value added tax" VAT, that depending on where you live in the EU changes in percentage. You are automatically charged at checkout then they automatically take it out of my account (either paypal or Etsy depending on where you've purchased the pattern). I have absolutely no control over this. Personally, I think the percentages get a little extreme on such a small amount. I wish there was something I could do because I believe it's a deterrent but unfortunately I can't. Hope this helps to clear that up and thank you for taking the time to write! Do you have this in the regular crochet patter yet? 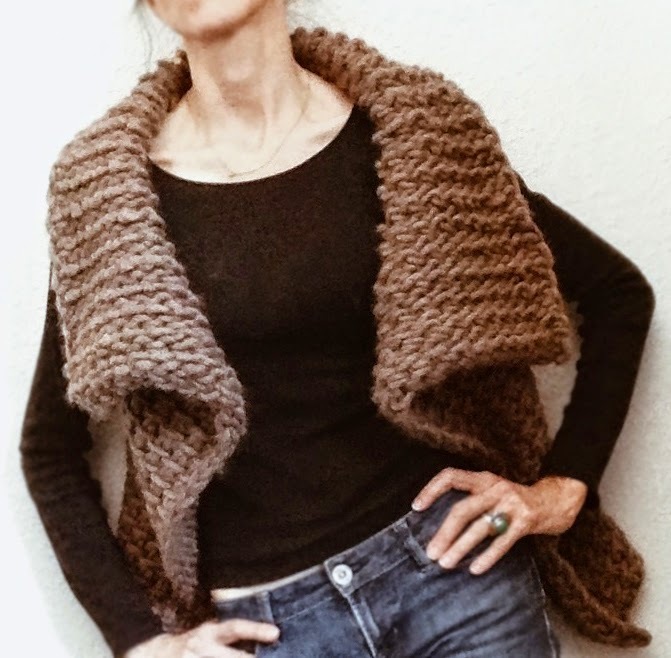 I love this vest and just getting back into crocheting ... call me a beginner so I don't want to confuse myself with trying to learn Tunisian right now.